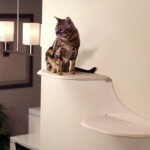 The GoPetClub Cat Tree, which is a massive 50 x 26 inches at the base and measures 72 inches high, is full of great features that your cats will most assuredly enjoy. The sturdy wood pieces are held together with fasteners, as opposed to glue. This means that if they start to loosen or get wobbly a simple tightening should fix the problem. 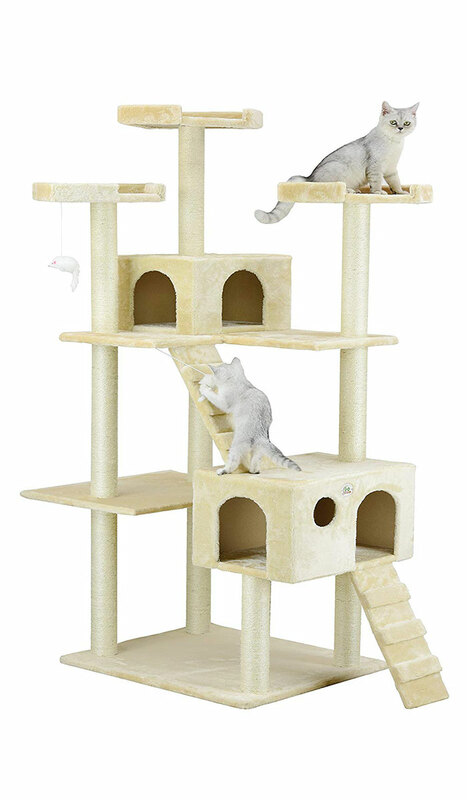 The cat tree also has three tower-style perches, as well as two kitty-condos and multiple hanging toy mice for your feline’s playing pleasure. A gangway will allow your kitty to climb the tree easily, and all perches and horizontal surfaces are covered in a plush style faux fur that is extremely soft and comfortable. The towers are wrapped in sisal rope so that your pets have a durable scratching area, and the wood pieces used in this tree allow for easy customization of your pet tree. The GoPetClub Cat Tree has been reviewed and rated more than 500 times online, and it averages a near five-star rating on a five-star scale! Out of all of these reviews, the feature most commonly talked about by people that have purchased and rated this product is the durability. Many reviewers spoke of multiple cats, some larger than 15 pounds, playing, running, and jumping all over the cat tree and years later it still looked and worked as well as it did the day that they put it together. The few purchasers that gave this product a low rating all seemed to have the same common complaint. They complained that the cat tree had a strong glue odor when they took it out of the box. The glue is used to adhere the rope and fabric to the posts and platforms, and all cat trees use glue in some aspect of their construction. The glues used in cat trees are a non-toxic adhesive, and the strong adhesive odor will dissipate soon after the cat tree is taken out of the box and assembled. The GoPetClub cat tree is a wonderful cat tree that will provide your kitty with hours of entertainment, as well as a comfortable place for your pet to sleep. 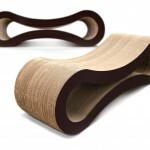 Its multiple levels, sisal rope towers, and attached mouse toys keep your pet active and busy. This cat tree is perfect for both single and multiple-cat homes, and will withstand the abuse that larger, active cats can administer.